In the coming year, the corner of Brandon and Hayes Streets in Chapel Hill, just east of the UNC campus, will be taking on a new look. This is the northeast corner of Glen Lennox, and it’s here that after more than ten years of dedicated and thoughtful work by the community, the Town, the County, investors, consultants, and the Grubb Properties team, the first phase of a long-planned, comprehensive redevelopment of this landmark Chapel Hill property will begin. 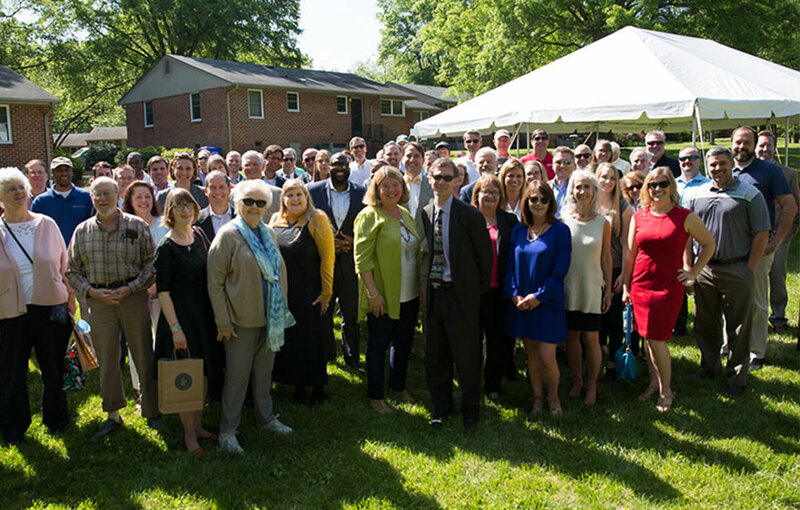 On May 2nd, Glen Lennox’s owner and management company, Grubb Properties, hosted a gathering at the site to take a rare moment of pause to simply and quite publicly say “thank you” to all those whose efforts have made the redevelopment of this property possible. Grubb has owned and managed the property since 1986 and has spent the last decade collaborating with town government, city planners, investors and surrounding businesses and neighborhoods to arrive at a consensus to create a fresh future for Glen Lennox which maintains its underlying spirit and character. CEO Clay Grubb expressed gratitude to those collaborators as well as Grubb’s own staff for their contributions and commitment. He also stressed the firm’s belief in the importance of investing in the community, a philosophy established by his father, Grubb founder Robert Lay Grubb, who was a Glen Lennox resident in his student years. Also speaking at the Wednesday event were Mayor Pam Hemminger, Chamber President Aaron Nelson and County Commissioner Penny Rich. They spoke of the legacy and importance of Glen Lennox as a key element in the personality and panache of Chapel Hill. As one of America’s first planned communities, the original Glen Lennox was uniquely successful in providing a vibrant place for family living, convenient shopping and requisite industry. The new Glen Lennox will be a modern interpretation on that theme: a bicycle-friendly live-work-play community with generous green space keyed to a human scale. It will embody leading-edge theories in urban planning which reduce reliance on vehicular traffic even as it maintains the trademark inclusive bonhomie that has attracted such a wide spectrum of residents. Glen Lennox is not and never will be a gated community. It is a place where all can feel welcome. character and essence that has made Glen Lennox such a positive impact on the community. As Clay Grubb, Mayor Hemminger, Commissioner Rich, Chamber President Nelson, and long-time property manager (and doyenne of Glen Lennox) Vanessa Blackwood-Spinks all underscored, for this venerable property to have progressed to this stage has required a true spirit of collaboration among all parties. And to fruition this community vision for a renewed reenergized Glen Lennox, the way forward is to continue to embrace this collaborative spirit together.